When Samsung revealed the Galaxy S9 and S9 Plus phones in February, the company also announced its new DeX Pad, which enables you to view applications on an external monitor while using the phone as a touchpad. Samsung has now opened pre-orders for the DeX Pad in the US, priced at $99.99. The device will ship in the week beginning 13 May 2018. If you're in the US, you can also get a Dex Pad free if you order a Galaxy S9 or S9 Plus through Samsung's website. We have no word of availability outside the US yet. If you want to be able to work on a larger screen from time to time, the DeX Pad is neat solution. Once plugged into a monitor, you dock your Galaxy in the Pad and then your phone launches a DeX mode on the monitor, allowing you to open your applications in separate windows, much like using a PC. The DeX Pad also features a USB-C charging port so you can charge your phone while you work as well as two USB-A 2.0 ports and an HDMI output, so you can connect a keyboard and mouse as well if you like. it also features a built-in fan to keep your phone cool while it's docked. 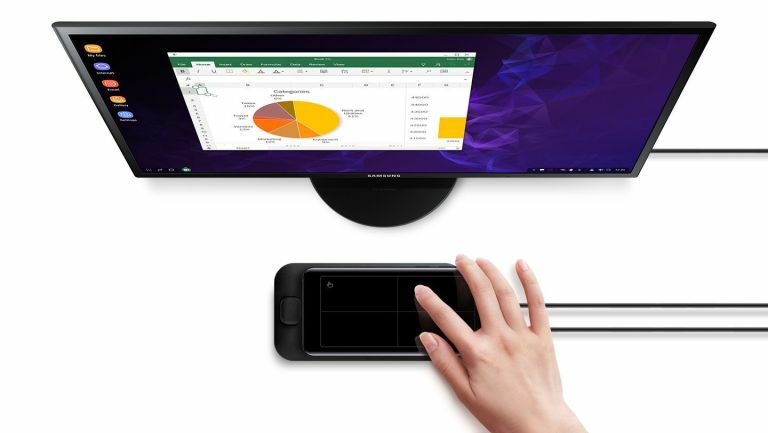 For more information, read the Samsung DeX Pad review by our colleagues on TechRadar or check out the offical page on Samsung's site.